Crystal structure of the Jak3 kinase domain in complex with a staurosporine analog. Activating mutation in the tyrosine kinase Jak2 in polycythemia vera, essential thrombocythemia, and myeloid metaplasia with myelofibrosis. 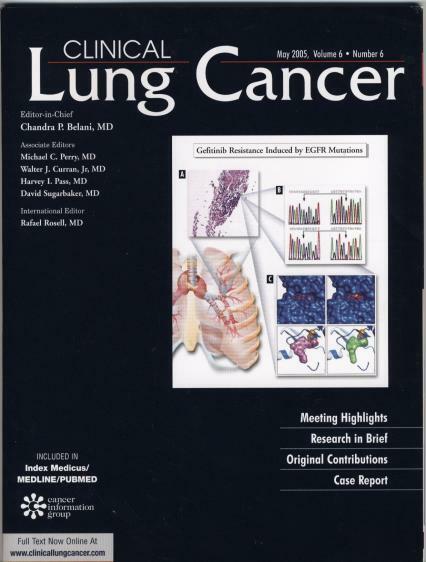 EGFR mutation and resistance of non-small-cell lung cancer to gefitinib. N Engl J Med. 2005;352(8):786-92. Activating alleles of JAK3 in acute megakaryoblastic leukemia. Walters DK, Mercher T, Gu TL, O'hare T, Tyner JW, Loriaux M, Goss VL, Lee KA, Eide CA, Wong MJ, Stoffregen EP, McGreevey L, Nardone J, Moore SA, Crispino J, Boggon TJ, Heinrich MC, Deininger MW, Polakiewicz RD, Gilliland DG, Druker BJ. JAK2T875N is a novel activating mutation that results in myeloproliferative disease with features of megakaryoblastic leukemia in a murine bone marrow transplantation model. Identification of Driver and Passenger Mutations of FLT3 by High-Throughput DNA Sequence Analysis and Functional Assessment of Candidate Alleles. Frohling S, Scholl C, Levine RL, Loriaux M, Boggon TJ, Bernard OA, Berger R, Dohner H, Dohner K, Ebert BL, Teckie S, Golub TR, Jiang J, Schittenhelm MM, Lee BH, Griffin JD, Stone RM, Heinrich MC, Deininger MW, Druker BJ, Gilliland DG. Resistance to an irreversible epidermal growth factor receptor (EGFR) inhibitor in EGFR-mutant lung cancer reveals novel treatment strategies. Yu Z, Boggon TJ, Kobayashi S, Jin C, Ma PC, Dowlati A, Kern JA, Tenen DG, Halmos B.
BIM mediates EGFR tyrosine kinase inhibitor-induced apoptosis in lung cancers with oncogenic EGFR mutations. Costa DB, Halmos B, Kumar A, Schumer ST, Huberman MS, Boggon TJ, Tenen DG, Kobayashi S.
Automated Protein Crystallization Trials using the Thermo Scientific Matrix Hydra II eDrop. Murthy TV, Wang Y, Reynolds C, Boggon TJ. Journal of the Association for Laboratory Automation. 2007; 12(4):213-218. Structures of Lung Cancer-Derived EGFR Mutants and Inhibitor Complexes: Mechanism of Activation and Insights into Differential Inhibitor Sensitivity. Yun CH, Boggon TJ, Li Y, Woo MS, Greulich H, Meyerson M, Eck MJ. The structural basis of integrin-linked kinase-PINCH interactions. Chiswell BP, Zhang R, Murphy JW, Boggon TJ, Calderwood DA. Disruption of the EGFR E884-R958 ion pair conserved in the human kinome differentially alters signaling and inhibitor sensitivity. Tang Z, Jiang S, Du R, Petri ET, El-Telbany A, Chan PS, Kijima T, Dietrich S, Matsui K, Kobayashi M, Sasada S, Okamoto N, Suzuki H, Kawahara K, Iwasaki T, Nakagawa K, Kawase I, Christensen JG, Hirashima T, Halmos B, Salgia R, Boggon TJ, Kern JA, Ma PC. Domain mapping of the polycystin-2 C-terminal tail using de novo molecular modeling and biophysical analysis. Celic A*, Petri ET*, Demeler B, Ehrlich BE, Boggon TJ. The Structure and Clinical Relevance of the EGF Receptor in Human Cancer. Kumar A*, Petri ET*, Halmos B, Boggon TJ. Journal of Clinical Oncology. 2008; 29(10):1742-51.
da Cunha Santos G, et al., Annu Rev Pathol. 2011; 6:49-69. Structural and numerical variation of FLT3/ITD in pediatric AML. Meshinchi S, Stirewalt DL, Alonzo TA, Boggon TJ, Gerbing RB, Rocnik JL, Lange BJ, Gilliland DG, Radich JP. Tyrosine phosphorylation inhibits PKM2 to promote the Warburg effect and tumor growth. Hitosugi T, Kang S, Vander Heiden MG, Chung TW, Elf S, Lythgoe K, Dong S, Lonial S, Wang X, Chen GZ, Xie J, Gu TL, Polakiewicz RD, Roesel JL, Boggon TJ, Khuri FR, Gilliland DG, Cantley LC, Kaufman J, Chen J.
JAK3: a two-faced player in hematological disorders. Cornejo MG, Boggon TJ, Mercher T.
International Journal of Biochemistry and Cell Biology. 2009; 41(12):2376-9. Analysis of the cytoplasmic interaction between polycystin-1 and polycystin-2. Casuscelli J*, Schmidt S*, DeGray B, Petri ET, Celic A, Folta-Stogniew E, Ehrlich BE, Boggon TJ. Genetic abnormalities of the EGFR pathway in African-American patients with Non-Small Cell Lung Cancer. Leidner RS, Fu P, Clifford B, Hamdan A, Cheng J, Eisenberg R, Boggon TJ, Skokan M, Franklin WA, Cappuzzo F, Hirsch FR, Varella-Garcia M, Halmos B. Journal of Clinical Oncology. 2009; 27(33):5620-6. FGFR3 associates with and tyrosine-phosphorylates p90RSK2, leading to RSK2 activation that mediates hematopoietic transformation. Kang S, Elf S, Dong S, Hitosugi T, Lythgoe K, Guo A, Ruan H, Lonial S, Khoury HJ, Williams IR, Lee, BH, Roesel JL, Karsenty G, Hanauer A, Taunton J, Boggon TJ, Gu TL, Chen J.
Molecular and Cellular Biology. 2009; 29(8):2105-17.